The name SRT-10 stands for “Street & Racing Technology” and the figure “10” represents the number of cylinders in the V10 Viper engine. Dodge produced the completely redesigned Viper SRT-10 model with a new body style, upgraded interior, a conventional convertible top and a more technologically advanced engine. In the performance department, the Viper SRT-10 is lighter with 125 pounds less vehicle weight, an upgraded suspension system provides better handling and ride quality, stopping is significantly improved with a superior brake package that ranks at the highest level for a performance car brake system. Power output increases to a spectacular 500 hp and 525 ft-lb torque with a more technologically advanced V10 Viper engine that is also larger in displacement at 505 cid. The SRT-10 is equipped with a revised race type chassis and a new aluminum space frame that increases chassis stiffness for improved handling. In overall length, the SRT-10 is 1.1 inches shorter but the wheelbase is 2.6 inches longer than the GTS & RT/10. The weight of the Viper SRT-10 is 3,380 lb, in full street trim. The forged alloy SRT wheels are 18x10 front & 19x13-inch rear with Michelin run-flat Pilots with 275/35ZR18's in front & 345/30ZR19's in the rear. The most evident improvement for the SRT is the braking system. The SRT has four-piston calipers and 14-inch rotors that improve 100-0-mph stopping distances by 80 feet from the previous GTS & RT/10 model Vipers. A unique race car feature is the starter button that brings the 505 cube V-10 engine to life. Dodge Viper SRT-10 is a more sophisticated world-class super car. Chrysler’s Performance Vehicle Operations engineers designed the 2003 Dodge Viper SRT-10 Carbon Concept car to be the ultimate street-legal Viper. The carbon concept name symbolizes the use of light weight carbon–fiber for the Viper’s hood, bolt-on roof structure and the rear trunk lid. The PVO engineers proceeded to enhance performance by reducing weight and increasing Viper engine power. The carbon-fiber material and the ultra-lightweight (SRT) Street and Racing Technology forged aluminum wheels helped to reduce standard SRT-10 vehicle weight by 150 lbs. Viper Competition Coupe race engine components increased V10 engine performance to 625 horsepower with the use of cowl induction, a throttle body intake with 10 aluminum velocity stacks, and modified cylinder heads with oversized intake and exhaust valves. Viper SRT-10 Carbon Concept succeeded to be the fastest factory built street-legal Viper delivering 0-60 mph in 3.6 seconds and running down the quarter mile drag strip in 11.2 seconds at 128 mph. 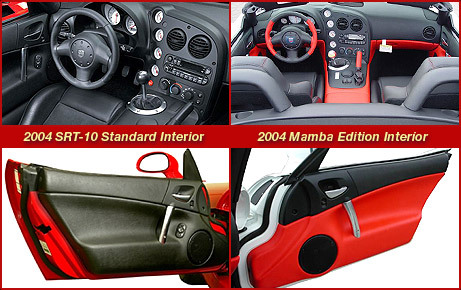 The 2004 model year Viper SRT-10 is offered with a dramatic option, referred to as the “Mamba” which consists of upgraded interior colors of Bright Metallic Silver along with Red and Black. The Mamba Edition SRT-10 Vipers are a limited production option and only 200 of this special version of the Viper are created.